You do a lot to drive traffic to your website. Even if you’ve attracted a lot of first-time visitors, a large percentage of them don't come back. However, you can increase the odds of them returning by running a cutting-edge “retargeting” campaign. I wrote this thought leadership piece for a national automotive dealer magazine to be useful to GMs and Internet managers who spend thousands of dollars every month to attract qualified local shoppers to their website every month, but don't have a strategy to "bring them back to buy" using online retargeting tactics. "I ask my peers all the time: 'What happens when a customer connects to your website, then leaves?,'" says Bobby Jorgenson, dealer principal of Kistler Ford in Toledo, Ohio. "After a long pause, I tell them about my reminder ads. 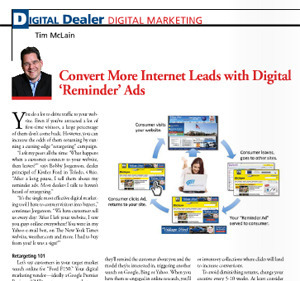 Most dealers I talk to haven't heard of retargeting." 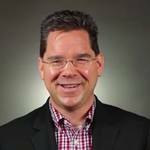 "It's the single most effective digital marketing tool I have to convert visitors into buyers,” continues Jorgenson. “We have customers tell us every day: ‘After I left your website, I saw you guys online everywhere! You were in my Yahoo email box, on The New York Times website, weather.com and more. I had to buy from you! It was a sign!’"
Let’s say customers in your target market search online for “Ford F150.” Your digital marketing vendor – ideally a Google Premier Business (SMB) partner – ensures that your dealership appears in the top two slots in local search results with hand-crafted text ads with strong calls to action, links to your inventory, and more. When customers click on your ad, you want to be sure to engage them as much as you can to get them to call, set up a test drive, etc. After a few minutes, your “qualified” customer may leave your site. But not before you’ve dropped a “cookie” into their browser. This little file will remain active for up to 60 days and track every site the customer visits, giving you the ability to make one of your display (banner) ads appear on the page. In many cases, these retargeting "reminder ads" won't necessarily generate a click. Instead, they'll remind the customer about you and the model they're interested in, triggering another search on Google, bing or Yahoo. When you have them re-engaged in online research, you'll want to appear again in the top three slots (what I call a "strong position") of every search, and get them to click back to your website.